ASP stands for Activated Sludge Process, which is a type of sewage treatment process used by many manufacturers including Conder ASP, WPL, Bio Pure, Biodigester, Vortex, etc. Not all Activated Sludge Plants (ASP) are created equal. There are a number of different ASP treatment systems, differing greatly in electricity consumption and performance. Why is this? After all, they all have the same primary function and treatment process? Bubble size is vital for energy-efficient aeration. The large bubble (20 mm) has a volume of 4.19 cm3 and a surface area of 12.6 cm2. 296 small bubbles (3 mm) could be made from the single 20mm large bubble pictured above it. They would have a total surface area of 83.6 cm2. This is 6.6 times the surface area of the large bubble. By using a small bubble diffuser instead of a large bubble one, 6.6 times as much water can be aerated with the same amount of air! The smaller the bubble, the greater the surface area compared to volume and the more efficient the oxygen transfer rate into the effluent. The finer the bubble, the less total air volume is required and a smaller, less wattage blower can be used for the same performance. Additionally, bubbles formed deep within the chamber will have more pressure to drive the oxygen transfer and more time-of-contact with the air-water interface. Why don't all ASP sewage treatment plants use small bubble diffusers? Quite simply - most can't. Unless the sewage is in a 'soup' form, ASP's can't digest it. With most ASP sewage plants, the raw sewage enters directly into the digestion chamber and it must be first converted into a slurry before digestion can start. This is impossible with a small bubble diffuser as the vigor of the bubbles is not great enough to smash the solids. They need large bubble diffusers, (which also need a lot more air to aerate the sewage) to provide enough disturbance to liquidise the faeces and paper. 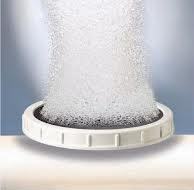 Large bubble diffusers need large amounts of air to achieve the correct oxygen transfer. This means that they need large, energy guzzling blowers using far more electricity - up to 135 watts/hour for some 6 person ASP plants. Small bubble diffusers are many times more efficient at achieving oxygen transfer, so they can utilise much smaller, energy saving blowers. The only ASP plants that can utilise the energy saving feature of a small bubble diffuser are the ones with a vibro-screen, or similar, which liquidises the solids BEFORE they enter the digestion chamber. The only one in the UK that does this is the Vortex sewage treatment plant. This is why it is the most energy efficient ECO electric treatment plant on the market. The performance of any ASP sewage treatment plant is directly linked to the oxygen transfer rate of the system. The key component in transferring oxygen to your sewage treatment plant is the diffuser. Companies that sell ASP sewage treatment systems with coarse diffusers and simply offer larger pump sizes to cope with larger populations know very little about oxygen transfer. Increasing the amount of air going into the system does not automatically increase the oxygen transfer rate - it simply causes bigger bubbles and in some cases, can actually REDUCE the dissolved oxygen. 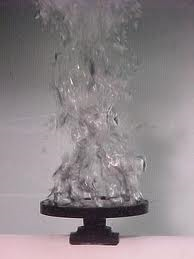 This does not happen with fine bubble diffusers. Ask them about oxygen transfer and dissolved oxygen rates for their plants and don't be surprised if they don't know the answers. Notice that the image shows the small bubbles gently breaking the surface and covering a wide area for efficient, effective oxygen transfer. The 'blue' hue is caused by light reflecting from the thousands of small bubbles. Compare this to the turbulent action from the competitors coarse bubble diffuser on RIGHT caused by large bubbles. Note the lack of blue hue and the small area of aeration achieved with inefficient oxygen transfer. These two pictures above show the story clearly. Each picture captures just under one second of action from both a fine bubble and coarse bubble diffuser. The coarse bubble diffuser is sold with a well known, market leading ASP. The test was run using the same make and model of pump. All variables were exactly the same. All camera settings were identical for all photos taken. The two pictures were taken less than 10 seconds apart so lighting was the same. The images were not touched up or changed in any way other than resizing them. When shooting the competitors diffuser the camera needed to be moved back approximately six inches to prevent it from getting wet due to the large size of the bubbles.